WAT: By calling Florida wrong twice -- first for Al Gore, then for George W. Bush -- television networks hit an avoidable iceberg that had been on their radar screen for many years. RIS: All of this for no good reason. Americans are much more interested in having the election returns reported accurately than they are in whether one network comes in a few minutes ahead of the other in reporting the results. Very few people know at the time which network is coming in first, and even fewer of them would remember today… We question what purpose this hyper-competition serves, either journalistic or commercial. AIL: In the closest race in history, the wheels came off a rattletrap computer system we relied on. KON: CNN executives, correspondents, and producers themselves described election night coverage as "a debacle," a "disaster" a "fiasco." 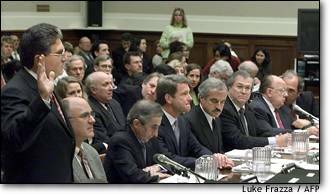 The first question was whether the Committee had the right to demand their presence, especially when colored by the dubious Republican proposition that the networks had deliberately delayed reporting Bush states. In capsule conduct: Ailes was pugnacious + funny, Boccardi resentful, Weston uncomfortable, Heyward somewhat arrogant, Konner curt, Lack ingratiating, Biemer overly academic, Wattenberg entertaining, and Johnson chagrinned and most responsive. BOC: AP has serious doubts that the Committee and its staff, no matter how sensitive they may be, can avoid crossing the line between appropriate government concern with the electoral process itself and, on the other hand, inappropriate government involvement with the reporting on that process by a free press. … To put it more plainly, we believe that such an official government inquiry into essentially editorial matters is inconsistent with the First Amendment values that are fundamental to our society. We agree that there were serious shortcomings -- call them terrible mistakes -- in the election reporting … and that these mistakes cannot be allowed to happen again. But fixing them is a job for the nation's editors and news directors, not its legislators. What we report and when we report it are matters between us and the audience we try to serve, not matters between us and our Congressman. TAUZ: “The Commerce Committee has heard 178 witnesses, all under oath- it has no meaning other than investigative meetings are taken under oath. VNS modeling is seriously flawed: it underestimated poll numbers in 32 states for Bush and ..only 15 states for Gore. They overestimated 15 states for Bush and 34 states for Gore. DINGELL: “It appeared by many that this inquiry was an attempt by the Republicans to shift attention from election problems in Florida that cost Gore the Presidency… For good motives and bad, elections have been called wrong by the media for a long time.” =The 74 year old Dingell reflected on the Alf Landon/Roosevelt and Dewey/Truman miscalls that he’d lived through. CNN: Tauzin said the subcommittee's "analysis of the networks' election night ‘victory calls' indicates an incontrovertible bias in the results which were reported." The networks "consistently reported Vice President Gore's victories earlier than Governor Bush's victories, portraying a skewed electoral picture and disenfranchising many American voters," he said. STUPAK (D-Oh): You (Tauzin) seem to make a premature call (of bias) just like the networks did on election night. Impeachment Manager (prosecutor) Steve Buyer (R-In) was the most aggressive and relentless in pushing the Repub hypothesis that a cabal of liberal outlets had corruptly thrown Fl to Gore early and delayed reporting Bush wins- incredible, since the greatest television mistake in history had just happened because they reported results too fast; here Repubs were attacking media for reporting results too slowly. BUYER: We live in a republic, not a democracy (as evidenced by Fl). In Indiana, it’s not even debated whether there’s a bias in some of the news… so when someone acts irresponsibly, it’s an invitation to government intrusion. You have an editorial problem! SAV: The notion that some kind of political bias enters our work is simply without foundation, and … that appears to be common ground among those of us here today. WAT: Many people would say the networks are too liberal. Mass. Rep. Edward MARKEY devastated that theory: (The question is) whether early calls were a vast left-wing conspiracy. Were dozens of network journalists, the staff of VNS, all network news directors, a score of network anchors, and the President’s first cousin all co-conspirators in an intricate plot to call key states early for Gore? It is, of course, preposterous. Their only bias was their desire to be first – this competitive urge which blurred their own judgment. =Republican concerns were based on a few Bush states: Ga, Al., NC, Co., Va that ended with sizable Bush leads, but were called ½ hour to an hour after poll closing by the networks. http://com-notes.house.gov/bush_nine.pdf (only lists the later VNS call times). The striking thing was that VNS didn’t lead the networks - the networks called races before VNS (up to several hours) or tied them in almost every instance, inc. Fl for Gore, except Wash. and Wisconsin, so any bias was questionable. CBS/CNN explained that the exit polls were terrible in those states. As you can see the exit polls in these five states were off by between 7 and 16(!!!) points. We waited for actual results in each of these five states and called them as soon as we were sure that Bush would win. In North Carolina our call was 28 minutes after poll closing; in Georgia it was 32 minutes after poll closing. In Alabama VNS made in our view a very reckless poll closing call for Bush while Gore was actually leading in the best survey estimate at that time. We believe that this is the first time that a projection was made using an exit poll that actually showed the other candidate ahead. We could not allow this call to go on the air until we had seen some actual returns. At 8:25 – 25 minutes after poll closing – Bush had achieved a lead and we called the race for CBS & CNN. =CNN seemed to reap the most enmity of the Republicans for it’s alleged liberalness- interesting, because it was considered an inexperienced corporate mouthpiece when it started 2 decades ago. ‧‧‧‧ Fox had 8 first calls--9 when we add the Election Night call for Bush in Florida-- and 4 of the 9 were made at the same time as another network. Fox was the second to call the race in three states. ‧‧‧‧ NBC had 7 first calls--8 if we count the Gore call in Florida. Five of the first calls were made at the same time as another network. There were 5 second calls--6 with the call for Bush in Florida. One of those calls was made at the same time as another network. ‧ ABC had 2 first calls and 11 second calls--12 with the pullback from Bush in Florida. =CBS is quite proud that they had the most first calls- in this case, though, the winners were probably the losers. ABC: ABC News never projected a winner in the presidential race in Oregon, which was resolved several days later, after the last of the absentee ballots was counted. In addition to the projections in the race for President, ABC News made 45 projections in races for the Senate and for Governor, all of which were correct. ABC News never projected a winner in the key Senate race in Washington. ABC News made 49 other projections of state races for President on November 7-8, and each one was correct. Tauzin then played a 10 min. Repub prepared videotape of election highlights (or lowlights), including Dan Rather’s resplendent array of metaphors: “Bush wins, that’s it.. sip it, cup it, photostat it, underline it in red, press it in a book, put it in an album, hang it on the wall.” Nothing equivocal about Dan. The tape seemed to show an unstoppable momentum for Gore, with talk of the paramount importance of Pa, Mi, Fl, and Gore’s wins rolling in succession, the point being to show how the slightly early call for Gore (7:48pm- 8-12 min. before polls closed in 10 W Fl counties) caused Repubs to not vote across the country- a highly dubious proposition, since Bush had been claimed to be ahead 3-6 points in polls- Gore wins might pull Bush voters into the polls or make Gore people vote for Nader. 10 minutes before poll close, any voting voters are in a car, not watching TV. LAK: Let me respond by stating, unequivocally, that I am absolutely certain that political bias played no role in NBC's election night reporting. HEY: The video that said Gore had it in the bag was misleading: 15 times between 7 and 11pm we displayed the popular vote graph- President Bush was ahead every single time and on the electoral count- 75 out of 100 times. KON: It’s up to the voter to vote, period… that is their responsibility. Jane HARMAN (D-Ca): (Rep.) Jim Corman lost because Carter conceded early in 1980 and no Democrats showed up after. Since 1992, I’ve never been elected by more than 5%, so am extremely sensitive to the impact of early election calls. CNN: Early TV verdicts of Reagan’s victory did not depress turnout anywhere near the extent critics had predicted: only 2.6 percent of the non-voters blamed TV for their failure to vote – roughly less than one-quarter of one percent of the entire electorate. Most non-voters had not heard the TV projections. The same conclusion was reached in eastern Oregon where a natural experiment allowed contrasting turnout and time of voting in Malheur County (MST) with that in Grant County (PST). The counties were demographically similar, but Grant received an extra hour of projection news before the polls closed at 8:00 p.m. However, turnout after 5:00 PST was actually higher in Pacific-Time Grant County than it was in Mountain-Time Malheur County. KON: We found no convincing evidence that calls made before polls are closed within a state or in another state have an impact on voter turnout. =Every news head agreed that there should be a uniform poll closing and that they wouldn’t call a state before its poll closed, but all intended to continue exit polling. BOC: You start down a (dangerous) road: What about pre-election polling- if there’s a poll that says that this candidate is 20 points ahead, is that keeping people from the polls? Well, maybe we shouldn’t do those. CNN: Dec 15, 2000, Rep. Ed Markey (Mass.) introduced a bipartisan Uniform Poll Closing Act (H.R. 5678). This bill requires polls in all 50 states to close at 9 p.m. eastern standard time (8 p.m. central standard time, 7 p.m. mountain time) during Presidential elections. In order to set a 7 p.m. Pacific Time zone closing, daylight savings time would be extended for two weeks during Presidential election years, allowing for a West Coast poll closing of 7 p.m. Pacific daylight time. Denied any forum for investigating the multiple egregious voting problems in Florida, Dems on the Committee used the network hearings to vent their outrage at them, the decisive bad call for Bush, and networks poor coverage, especially their reluctance to question outlandish Republican assertions. DEUTSCHE (D-Fl): If this was a foreign country, no one would consider this a legitimate process. In 19 of 20 precincts in black neighborhoods in Duval Co. 20% of the votes were thrown out. Research showed you needed a 4th grade education to get through these ballots. SHERROD: Media has the responsibility to tell the people more of these voter suppression stories.. like Gov Pataki as he repeatedly said ‘4 recounts had been conducted.’ Lugar said his state doesn’t do hand recounts when a simple call to Indiana election officials proves they do. Media allowed Lugar + Pataki and countless other Republicans to repeat this mantra unchallenged. These statements resulted in a series of distortions, backed up by a conservative corporate-owned media too lazy to scrutinize such allegations and too eager to manufacture drama. The media have a responsibility to check the facts. Refrain from the ‘he said, she said’ approach to news, which causes politicians to exaggerate, to distort, and even to lie. Don’t accept what we say- make us tell the truth. DEUTSHE: The exit polling was probably more accurate than the actual count. It was 50 to 75 thousand people net who thought they were voting for Al Gore whose vote didn’t count. It is no longer debatable that if the votes were counted, Al Gore would be President. WAXMAN (D-Ca): The later rescinded late-night calls of Fl for Bush were the basis of perceptions that George Bush was the winner and Al Gore was the spoiler. It immeasurably helped Bush maintain the idea that he was the man who won the election.. (and) set in motion a chain of events that was devastating to Gore’s chances. =NBC’s Andrew Lack hit every hot button issue in a seemingly earnest mea culpa designed to spread blame. LACK: Where was our reporting before Nov 7 about the impact of ineffective voting machines or confusing ballots? We have a system that might in fact be protective of felons that vote. I don’t know why we didn’t know much about automatic recount standards. We know if you’re registered to vote, it doesn’t mean you’ll be permitted to vote. If you’re in the military and mail in an absentee ballot, it doesn’t necessarily mean it’s been counted. We know if you’re poor, it likely means you will have a little more difficulty voting than if you are rich. Millions of votes are thrown out in election after election. Now that’s a story and there’s a screw-up… We booted it in more ways than one. I ask that you extend your focus beyond what the networks experienced, but look at the problems that the voters experienced. As a journalist… I wish I had. SAV: Our (VNS) work involved more than 40,000 people who staffed nearly 28,000 individual precincts and went to some 4,600 counties to obtain the information that we needed. The plain fact is that, despite our best efforts, the Voter News Service let down its members, subscribers, and ultimately the American people, on Election Night 2000. = VNS has a $35 million operating budget. MARKEY: I think a terrible set of mistakes were made at VNS… We pay for pollsters as politicians, and if a pollster makes a mistake, I’m going to make all these expenditures based on that erroneous polling. I want to place the Queen of Spades squarely in front of VNS. (in Hearts the Queen of Spades is fatal). WAT: VNS, is, am, are the networks- they own it lock stock and barrel. (1) Sampling of voters in exit polls, 2.6 per cent. (2) Use of the 1998 Florida gubernatorial election to construct computer models for making vote estimates on Election Night, 2.6 per cent. CNN: Fluctuations, variations and contradictions had begun to appear in the basic system, including statistical models. From that point on, extreme caution should have been exercised in making any calls. Prudence demanded waiting for much more complete hard information. =It is notable that secretive VNS didn’t report the swapped exit poll numbers (between Gore and Bush) in a Repub district we heard from a highly placed source that may have led them to call the election for Gore. They never reported an alleged similar mistake in the ’96 NH Senate race either, and with only 6 mistakes in 2000 elections, had a virtually perfect record to protect. Then again, it was the Repubs on the warpath about the Gore call (with Cong hearings): arcane statistical polling mistakes are far less actionable than accidentally swapping numbers in a column. Or my source (or his source) may have confused that mistake with one of the 4 or 5 other numerical counting mistakes in Florida, but he reconfirmed the story in response to pointed inquiries. That call remains a stunningly arrogant mistake on VNS and the networks behalf: it was made with only 4% of the actual vote counted and Bush, not Gore, was then ahead by 6%; and from only 45 Florida precinct exit polls out of almost 6000 total. CNN: The Decision Team determines that the probability of a Gore win in Florida is within its guidelines for a call, which means there is a 99.5 per cent probability of a Gore win (or)… only a 1 in 200 chance that such a call could be wrong. CNN: (from RTI report) RTI noted that VNS had explained to the owners “that inadequacies in their budget have prevented them from making many needed improvements,” in such things as methodology, equipment and even adequate pay to hire qualified field interviewers. RTI warned that the standard errors reported on the VNS decision screens “tend to importantly underestimate the true total error in the estimates.” The information provided on the screens is so voluminous and complex as to be “prone to misinterpretation. Another area of concern is the absence of any direct quality control check on the interviewers' data collection activities (which was displayed in not catching bad mistakes). Exit poll non-response has become a “serious problem.” (those who refuse to answer). The average response rate in 2000 was 51 per cent, a drop from 55 per cent in 1996 and 60 per cent in 1992. The exit polls have consistently over-represented Democrats, which could reflect a bias from non-response. CNN: “The exit poll is a blunt instrument,” said Mitofsky. Lenski (Decision Desk partners) said he believes the polls are getting less accurate. They noted that in eight states the final result did not turn out the way exit polls had indicated. They believe that they would have been derelict in their duties had they not made the two calls on Florida, based on the data supplied to them. The (CBS/CNN) Decision Team first alerted VNS to the Duval error, and the team complains that VNS did not promptly alert it to the Volusia error once it was found and processed into the VNS system. They believe that current VNS exit poll models are inaccurate in states where the absentee vote is more than 10 per cent. WAT: Exit polls, whether accurate or not, are self-generated news. Their use by television networks to project election results is an attempt to forecast what is not yet known -- the actual vote count. CBS: CBS News called New Mexico for Gore at 10:21 PM on Election Night, nearly an hour and a half after the polls had closed there and with about half the precincts included in the count. The call was withdrawn on Friday, November 10, at around 3:00 PM. CBS News also called Maria Cantwell the winner in the Washington Senate race at 12:52 AM, nearly two hours after the polls had closed there. That call was retracted four hours later. After several weeks of counting, the calls were confirmed. But, given the closeness of both races, neither call should have been made. In both cases, the problem can be traced to bad information about which votes were counted. In the case of New Mexico, there was a faulty report from Bernalillo County, the state’s largest. The county reported to VNS on Tuesday night that all but 2,000 absentee votes had been counted. Later, the county found some software problems in the vote-counting program, so on Wednesday officials removed 67,000 of the absentee and early votes for another count. The slow recounting in the next few days, accompanied by misplaced ballots and accusations of partisanship, eventually dropped Gore’s lead to less than 200 with 1,800 votes yet to be counted, and the call was withdrawn. Gore was finally certified on December 5 as the winner of New Mexico’s five electoral votes. In Washington State, the call was based on a combination of information and assumptions: an exit poll of those who voted at their polling places on Election Day, a telephone poll of those who voted by absentee ballot, and tabulated votes from approximately 26 percent of the precincts and a large share of the already-counted absentee vote. The CBS News Decision Team assumed that about half of all votes (polling-place and absentee) were counted when CBS News called the race and that Cantwell could safely be declared the winner. But, in fact, only about 40 percent of the eventual total had been counted. That fact, combined with an exit poll and a pre-election absentee (estimate) that were at the outer limit of sampling error, made the election closer than it (appeared). Cantwell was declared the winner in mid-Dec.
=VNS’s true crime may have been holding the rotten numbers from the Volusia machine mistake (16,022 vote drop for Gore, 2813 gain for Bush) for 2 to 4 hours (reported on County website at 10pm and removed at 12, but copied onto Daytona Beach News-Journal till the next afternoon), then inexplicably releasing them into the VNS system at 2:08. The crucial question- why?- was never asked at the hearings. A high source claimed that VNS phoned a Volusia official after 2am, but Volusia spokesman Dave Byron is adamant that that didn’t occur. “No one from VNS or any network contacted Volusia on election night to find out anything about this number. .. All it would have taken is 5 minutes to get this genie back in the bottle.” “We think.. VNS was picking it up from the Daytona News/Journal site that had taken it off of ours," Volusia Supervisor Deanie Lowe explained. “The County stopped updating their web site (removed Presidential race at midnight) and we were left with the incorrect numbers till the next morning,” said the News/Journal’s Matt Grimison, who “left (the Deland elections bureau) around 1:40am”. After sitting on these numbers for hours, VNS had to know they were wrong- how could a 16,000 vote drop not trigger human or computer alarms at VNS or the networks who all received that same info? The corrupted Deland precinct was the last one reporting. The 19,006 vote erroneous net gain for Bush provoked the fateful Bush victory call only 8 minutes later, it was the difference between an indication and a call. VNS presumes all precincts to be the same average size, which caused them to massively underestimate the remaining vote in giant S. Florida counties. The News-Journal also had the wrong numbers listed through Jan for those errors (and the original 19,000 vote mistake on their web site through Nov 8th or 9th), which led me and others to initially report it as a 25,000 vote error, when the County supervisor was unreachable. It was presumable that any error in a local paper would be quickly corrected. Great confusion existed about vote changes, because it depended on the time interval- a 19,000 mistake doesn’t cause a 10,000 or 25,000 vote change, but in the reporting interval, other votes may also be added. The CBS Report doesn’t specify the Volusia mistake; even the Feb CNN Report wrongly lists it as 20,000 when it was almost exactly 19,000 (with the actual votes from that precinct added), confirmed twice by Volusia election officials. CNN: In the Bush call, there was ample reason not to trust the VNS figures, which they now admit. Nevertheless, for whatever reasons, they overrode their best judgment. ABC: From 10:10 p.m. until 1:40 a.m. EST, the data and statistical models continued to be mixed, with all but one model (the one that included actual vote count from the counties) indicating that Mr. Gore would prevail. By 2:10 a.m., however, the data provided by VNS indicated that a full 96% of all precincts had reported and that, given the projections of the remaining outstanding vote, Mr. Gore would have had to win over 63% of the remaining vote to prevail. MARKEY: It’s clear that models used by VNS were deeply flawed. This flawed methodology and shoddy VNS data misled the networks news divisions. CNN: · There was almost no communication between VNS and its membership in the critical hours leading up to the Bush call. · Inadequate quality control at VNS (later admitted in a self-study) failed to catch the computer error in Volusia County. Consequently, the error entered the system. The error was not communicated to the members, even after it is was detected. · Other errors entered the VNS system for a variety of reasons. VNS became increasingly aware of this, but it did not provide warnings to its members. with the uncertain situation in a key state like Florida, particularly following the faulty Gore call and the mistake in Duval County. · It wasn’t until after 3 a.m. that John King made the first reference of the evening to an automatic mandatory recount in Florida. That was critical information that should have been reported much earlier. CNN (Decision desk failures): In the Bush call, there was ample reason not to trust the VNS figures, which they now admit. Nevertheless, for whatever reasons, they overrode their best judgment. · It failed to take into account the warning flags raised by previous errors in the VNS system that evening. · It failed to bring the proper journalistic skepticism to the VNS numbers. Despite the previous mistakes of the evening and despite the lack of communication, the decision desk accepted VNS numbers as "convincing." At least one other news organization was not convinced about making a Bush call; that is the AP, which was already seeing discrepancies in the numbers. · It failed to check with VNS before it made its call. · It failed to check other available sources of information, namely the AP and the official state tallies on the Web. · It failed to be in touch with Edelman at VNS until one full hour after the call was made. CBS: Had CBS News been checking two sources of the vote count--the Associated Press and VNS totals--the Bush call at 2:17 AM might not have been made. Instead of a nearly 50,000-vote margin statewide, the margin was just 30,000 votes. The AP entered a correction in the Volusia County totals one minute (2:16am) before CBS News made the call (simultaneously to the Fox call). VNS would not make its correction until 2:51 AM. The two sources might have corrected each other. However, if we had believed the AP data, we might have made the Bush call in Florida even earlier. It appears that bad Volusia County vote data had entered the AP vote total even earlier than it entered the VNS total. Beginning at 12:27 AM, Bush held a narrow lead in historically Democratic Volusia County in the AP count. Gore reasserted his lead with the AP’s 2:16 AM correction. Bush led in Volusia in the VNS tabulated vote beginning at 2:09 AM. That error was not corrected until 2:51 AM. BOC: The margin separating the two candidates had descended in the AP tabulation from over 100,000 at 1 a.m. on November 8 to about 45,000 shortly after 2 a.m. In the next 15 minutes, it plummeted to less than 16,000. AP continued to report that it was too close to call. CBS: As it turned out, the VNS Florida state manager did not use the AP as a resource either on Election Night or on the day following the election. On Election Night, the AP feed was unavailable to the vote-collection operation, and the planned comparison checks (?) between it and the VNS count were never made. Had the feed been working, the disparity between the AP and VNS Volusia County results would most certainly have been caught, though perhaps not in time to avoid the 2:17 AM call. However, there would certainly have been other county vote differences that would have been noticed, and if members had been made aware of those errors, they might have been more cautious in looking at the Florida vote count. There is yet a third source for vote-counting information--secretaries of state and county Web sites. These were monitored at VNS on Election Night, although apparently with varying skill and mixed success. Despite the increased number of state and county Web sites, most ran behind VNS in their vote totals. The most frequent VNS use of these sources was for verification. The Florida Secretary of State’s site ranked somewhere in between, and it was used mainly for verification and comparison. However, apparently at the critical period in the early morning hours of election night, the site was overloaded and could not provide results. WAT: Ironically, an election that is too close to call is itself a unique news story that should have kept viewers rapt for as long as it lasted. CNN, along with others, was driven by what appears to be a compulsion.. to provide an election result — even if there was not one. Apart from the hideously wrong exit polls, only one mention was made of the wildly gyrating national polls that led into election night with Bush the preordained winner by 3-6% points. STUPAK: I don’t know how you can have such wild swings (in pre-election polls). KON: We note that polls, in general, are statistical calculations, not factual realities; and as such, that they are an imperfect measure of voter intent and actual voting, especially in close elections. CNN: The supposedly sophisticated system of polling is not nearly sophisticated enough. It is a flawed system that fails to take into full account many dynamic factors—absentee balloting, early voting, demographic change in key precincts, a declining response rate to polling generally, the quality of questionnaires, vote undercount, mistaken balloting, computer error, human error and more. AIL: All four members of the Decision Desk had to agree on a call before it was recommended. John Ellis has almost 23 years of experience in calling elections. I am aware that Mr. Ellis was speaking to then Governor George W Bush and Jeb Bush on election night. I do not see this as a fault or shortcoming of Mr. Ellis. Quite the contrary, I see this as a good journalist talking to his very high level sources on election night. By the way, Mr. Gorman and Mr. Mishkin (Decision Desk) were speaking to high level Democratic sources throughout the evening. To be clear, there was no information which John Ellis could have given to anyone nor was there any unilateral decision which Mr. Ellis could have made which would have affected the outcome of the election. =The spectacular impropriety of Ellis’s position amazed some. “(in wonder) I can’t believe they let the cousin of the candidate call the election,” said a mostly Republican editor of a newsweekly. Only Rep. Sherrod plumbed the bizarre depths of Fox’s news practices. KON: If there’s a perceived conflict of interest, I would think there would be some layers of insulation. BIEM: When the Bush call was made, there was only a .6% difference; looking at the data on the screen- I wouldn’t have made that call- The data didn’t support the call. I don’t understand why the call was made. AIL: (Totally missing the point) We at Fox News do not discriminate against people because of their family connections. I am more than happy to give you examples of offspring of famous politicians who are employed at Fox News. =In fact, because of the misestimations of the remaining vote and the 23,000 vote errors for Bush, Ellis may not have been derelict at that point in calling the election, by their weak standards. But given the previous blown Gore call, given the multiple mistakes they knew about, given the fact Gore was then ahead by almost ¼ million, given the Democratic vote coming in from the Gold Coast- it was a catastrophic and outrageous mistake, and no doubt colored by Ellis’s passionate desire to see his cousin win. After being burned once, the other nets may have held off- every second of delay would have given more chance for the tumbling AP or Fl Sec State Bush lead to come to their attention: 47,000 lead at 2:12am, 30,000 at 2:16 (meaning automatic recount), 19,000 at 2:30, 11,000 at 2:52. AP allegedly sent out an urgent bulletin at 2:37 warning there was “the narrowest of margins” between candidates, which may have penetrated the Chinese Wall of network infallibility. That deathly final call halted all analysis or urgency of the incoming vote till they realized their exposure an hour later. Longtime Republican political operative Roger Ailes and Fox “News” had no second thoughts about Ellis- after all, they had wanted to make an impact in their first election outing. They did- they (and all networks) convinced Al Gore and most of the country that Bush won, and that lie ultimately became a self-fulfilling prophecy. CNN: It also threw one state and the nation… into confusion and helped lead one candidate into prematurely conceding to the other. WES: To some extent we were a victim of our own success. The long record of accuracy led to hubris. KON: We reported an impulse to speed over accuracy, and we attributed that impulse to the business imperatives of television news--to win the highest ratings, which is not a journalistic standard but a commercial standard. Ratings, that is the size of the audience, drive the price of the commercials, and commercials determine the bottom line profits of the corporations that own the news networks. One of the most intriguing queries came from Waxman (D-Ca), who asked Lack about whether GE Chairman Jack Welch had pressured the news division in Bush’s favor. WAXMAN: There’s an allegation that Jack Welch actually intervened in NBC to call the election for George Bush… from several sources. We’ve heard that it was captured on tape- filmed by NBC’s advertising + promotion dept. LACK: (chuckling) He was there, but that’s just a dopey rumor. WAXMAN: We request that .. you produce the tape, if such a tape exists. =According to a Waxman aide, NBC missed the deadline for complying with the demand from the committee, but were sending a letter of explanation. · upgrading and modernizing the VNS technical capabilities and infrastructure. We are determined to do everything humanly possible to make sure that these mistakes will never be made again. =All participants agreed that it was better to fix VNS than try to create something else. WAT: It’s a problem to have a single source, but if you have 5 separate polling operations, it might not be an improvement. CNN (Appendix 5): The standard for an estimated vote margin will be increased from 2.6 standard errors to four standard errors – i.e. a Critical Value of 4.0 instead of 2.6 will be necessary for a “Call Status” based entirely on exit poll data. (sounds impressive). Mitofsky favors having VNS abandon the release of “waves” of exit poll results to the networks early in the day. CNN will remain within VNS if -and only if - significant changes are made to assure that the errors that plagued election night coverage in 2000 do not recur. To accomplish these goals and to implement the RTI Report, additional financial contributions will be required of its members. CNN will fund a sample key precinct vote reporting system in the states expected to have the closest races. This will ensure that the network has a second source of data to use as a crosscheck against the VNS data. In addition, CNN will insist that the Associated Press vote tabulation system be better integrated into the election night data collection system. Exit polls will not be used for projections in close races. CNN will only use exit poll survey data to project a winner when the data indicates one of the candidates has a "large margin" at the time that the polls close in that state. If CNN can't make the call in a state at poll closing, it will then only project a winner in that state using actual vote data from the statewide vote tabulations and key precincts. If these standards had been in place on election night 2000, CNN's projection of a winner would have been delayed by at least 30 minutes in 10 states and Florida would never have been called early in the evening for Vice President Gore. As for calls made at poll closing in the 2000 election, 26 states were called by CNN, using VNS exit poll data right when the polls closed in those states. All were correct calls. Despite that, CNN will raise significantly the criteria for these exit poll projections above what was used on election night. CNN will not project a winner in a state, even if it is reported that all the outstanding ballots have been accounted for, if the balloting shows that there is less than a 1% margin between the candidates. CNN will no longer project the winner in a state until all the polls are closed within that state. CNN will peel back the curtain for our viewers on the exit poll and projection process, assigning correspondents to report how the key precinct and exit poll workers do their jobs and providing other "behind the scenes" reporting to show viewers how the projection process works. CNN will change its language and graphics on election night regarding projections. Until all the votes have been counted in each state, CNN will no longer call anyone the winner of a state. For example, anchors will say "CNN projects, that based primarily on exit poll estimates, that Al Gore will win Michigan," On election night, CNN's full screen graphics included the words "CNN Estimate" but the words were not as prominent as they should have been. CNN enthusiastically supports the adoption of a nationwide Uniform Poll Closing Act by Congress. If so adopted, CNN pledges not to make any projections until all the polls are closed nationwide. = The CNN Report went even farther in recommending restricting dangerous practices. CNN: Exit polling for projection purposes: Cease the use of exit polling to project or call winners of states. The 2000 election demonstrates the faults and dangers in exit polling. Even if exit polling is made more accurate, it will never be as accurate as a properly conducted actual vote count, and the current network practice of sacrificing accuracy to speed should be reversed. Sample precincts for projection purposes: The use of returns from sample, or key, precincts for projecting or calling winners also should be halted. These precincts, thought to provide a representative sample from which larger results can be extrapolated, are subject to numerous errors. Accuracy over speed: Whether networks are trying to come in first, or simply trying not to come in last, it is very clear that the competitive zeal to report election returns quickly led the networks badly. CNN should clearly emphasize that it prefers accuracy over speed in reporting election returns, and its performance should make it clear that this emphasis is genuine. We hope that all networks adopt such a policy. All would no doubt say that they follow such a policy now, but their actual performance on Election Night 2000 makes such an assurance hollow. Early calls serve no particular public or journalistic purpose. Taking a long view, it appears they do not even serve a commercial purpose. While uniform poll closing (and the consequent delay in calling elections) sounds like a perfect solution, there might be unintended consequences. It opens up a much larger window for misinformation and even disinformation to appear in uncontrolled outlets. In 2000, various Internet sites published information leaked from VNS exit polls. This practice began in February, when slate.com published exit-poll results about the New Hampshire primary. Slate did so again in South Carolina, and was followed by nationalreview.com and the Drudge Report on other primary days. On Election Day, exit polls were cited in midafternoon on-line (the Drudge Report and inside.com) and on talk radio (Rush Limbaugh), with results attributed to “campaign, sources” or simply “sources.” Some of the information was correct (“Hillary Clinton is ahead in New York”), while some was either wrong or very premature (“Bush holds an edge in...New Mexico, Wisconsin and Iowa”). =No one else agreed to the 1% rule or to not use exit polls unless there was a large margin. All pledged to not call races until polls closed, all supported uniform poll closing times, promised to integrate AP and possible other sources, all resolved to fix VNS, and pledged to elucidate the difference between projections and actual vote totals. ABC: Until now, however, ABC News has not sought to restrict access of members of its Decision Desk to the reporting of other news organizations, including competing television news organizations. It was thought that the knowledge of what other credible news organizations were and were not projecting could be helpful to the Desk in determining when it was appropriate to make a projection. Competition, in news reporting as in other enterprises, can be a good thing. But competition that encourages a journalist to report a story prematurely is bad. In the particular instance of the Decision Desk, it is most important that the individuals making projections do so based on two things: the data provided to them (from exit polls, from actual vote tallies, and from statistical models), and their own experience and judgment. They should not be distracted or influenced by the decisions of other news organizations. CBS: Move the Decision Desk into the Election Night studio. This will promote constant contact between the newsgatherers and the analysts. If a story is breaking, as it was in Florida this year, there will be constant interaction, instead of the Decision Desk functioning in a vacuum, as it did this time in an office three floors from the studio. CNN: Television interfered with the electoral process and the election result. In our opinion, that constitutes an abuse of power, if unintentionally so, by CNN and by all the mainstream television news operations. Television news did not adequately carry out the role of free journalism in a free society in the 2000 election. AIL: In my heart I do believe that democracy was harmed by my network and others on November 7. I do believe that the great profession of journalism took many steps backward. *In ’85, controversy about the early call for Reagan in his blowout against Mondale lead to hearings in the Election Subcommittee, where NBC, CBS, + TBS News Presidents testified, according to Arturu Silva of the Commerce Com.. Press Dept.. Other election hearings were also held in Feb ’84 and July ’83.